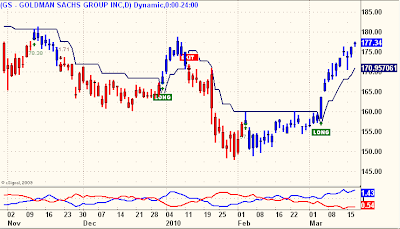 GS was one of three stocks I mentioned as possible Longs in my Weekend Update. Here is the updated GS Daily Trend Model, for anyone trading it. Well, they almost that way! "I came, I saw, I conquered!" If you had followed All Allan's garish advice on 7 September 2007, your NNVC would be worth 140% more today. My experience with this blog. Been a constant reader for over 3 years. I read the NNVC thing but only after reading some 70% of the 2004-2007 posts on All Allan did I subsequently purchase my 10K shares with the full intention of Buy & Hold. For better or worse. Whether this company succeeds or fails or gets bought out by GERN or DNA, may the gods bless the blog owner. off the subject, but didn't want to bother Allan with an e-mail. all of his attachments come to me (on a Sony Vaio) in Paint Shop Pro. I used to have a temporary version, but has expired......$600+ to download the software. Is he senting the attachments to everyone in this Paint Shop Pro, or is there something with my computer that i can change to open these files with a different format. Thnx for any help. I get a lot of other files in different formats, and have no trouble opening them. Just Paint Shop Pro id locked. Its no bother, you need to be seeing the attachments. I am using a MacBook Pro, taking a screen shot of my tables and charts, which defaults to a .png file which I then attach to the emails. I can also "Save As" those .png files to .gif or .jpeg or about a half dozen other formats, its just more extra steps that I would like to avoid. But most importantly, subscribers must be able to open the files I send, so all suggestions are welcome. thanx Allan...........i'm just not technosavvy enough to know if i can take that Paint Shop Pro, or .png file and change it to another format for viewing...any help from your readers appreciated. i can't immagine that every subscriber pays for PSP.....it's odd that sometimes your charts and even graphsappear directly in the e-mail without having to download them. The problem with the fellow's computer that can't open image attachments is that the file extention (.png, .gif etc) is associated with paint shop. File explorer, tools, folder options, File types. You can manually remap .png, .gif etc to some other tool that opens images. Worst case make it IE. Or download this free good tool and allow it to be associated with all graphic types. what is Prechter saying about DJIA breakout today? Seems his prediction of a bear resumption has now been foiled. only hope for bears now is passing of Obamacare or Iran war ... this weekend. You who think Allan is So Great for picking NNVC....well he's better than that. He picked NNVC at 10 cents back in September of 2005. In about 4 months it went to $3.70.....3700% in 4 months!!!! Now we are roaring back!!! You who mentioned the 3700% in 4 months after Sep2005. Yeah, I knew that already. I can't open .png on my Blackberry. Sometimes I am at my computer where I can open the .png files and sometimes I am on the road using my Blackberry. I asked Allan once before to send them to me in another format so I could read them on the road and he graciously did so. Allan, I am wondering if you can do that from now on because it would be a pain to email you every time I need the .jpg version? Can you change your default save extension from .png to something else? I think the 'problem' they are having,I mean,lets look at this for a minute. This guy,Bob Prechter,is famous and deserves to be. He has been amazing over the years ,brilliant in his analysis and understanding.....UNTIL THE LAST YEAR. Something doesnt add up right. It deserves a good examination. Is his elliott wave counting wrong? Is he doing something different in his analysis? Something ISNT WORKING ANYMORE THE WAY IT USED TO. Its as if we are experiencing a sort of ...."new normal" wait ,where did I hear that phrase before? Its as if the markets, entire global market is somehow....not the same. not really operating under the classic elliott wave principles, the fibs, the trendlines, whatever it is. Something is abnormal. and this abnormal has become their 'new normal'. You know the government coined this term for the market.... "the new normal". They said it to us all in public. They gave us the clue. That was a kind gesture on their part. They were telling us that they have changed the Game,changed the rules, changed the whole game. It is real. The name kinda describes what they do.which begs the next question....how well are they doing that job? well...... they have fooled Prechter,and others, several times already. At some point about half a year ago, I decided that this government may actually really be,not just in some control ,but total control of the market movement.totally engineered and manipulated control of the Game. Prechter has coined a theory..."all one market". But he hasnt,as far as I know, come to imagine ...that this 'all one market' moves as One precisely Because it is an "all Rigged ,all engineered,all controlled, all manipulated market",which moves to the magic wand of the conductor...which is the Elite power structure,central bank power structure, some kinda power structure that is not you or me or a bunch of stocks at a certain price ,at a certain wave count, at a certain fibonacci. It is in the hands of the 'all seeing eye' of the Grand Team,the Masters of the new world order. which doesnt have to imply they are evil nor "doing god's work" as that creepy guy from AIG said...it may be morally neutral. But lets face reality,the new reality of this new normal. If THEY are in control of it all,then they must be exercising a grand plan. the timing, the whole thing,is in the hands of some power beyond what Prechter would call ...an Elliott wave structure. I started calling it my 'rigged game ' theory. For all I know it might just be all in my imagination. But after Prechters missed call in august of last year, and other experts missed call in september, and others in october, etc etc I cancelled my EWI subscription, and just started watching the 'new normal' game. I'm just watching.I watch the full moon even. This latest bottom in early february fooled the cycle timers, including me. and now.... while we wait for the trend reversal that weve been waiting for since last august...we are still left uncertain.... BECAUSE we are not considering that we may in fact be playing in a new (twilight zone) reality engineered by the Great Wizard. But I'm learning to love my beautiful plunge protection team. while I buy gold and silver at every major dip. while I buy NNVC and ISCO and UPWRF,JINFF,and BTIM and hope these stocks are immune to whatever future trouble might happen. It IS a completely engineered, rigged market,and its going in whatever direction THEY want it to. for as long as THEY want it to.and will reverse when THEY want it to. Jpeg is a more common and an older format than png. I would suggest you save the screen grabs as jpeg files. Gif file format would be a close second. One thing cool about gif files they can be animated. That is if you wanted to show something using animation on the charts. It is not very hard to do and I am sure there are freeware programs that can do this for you.